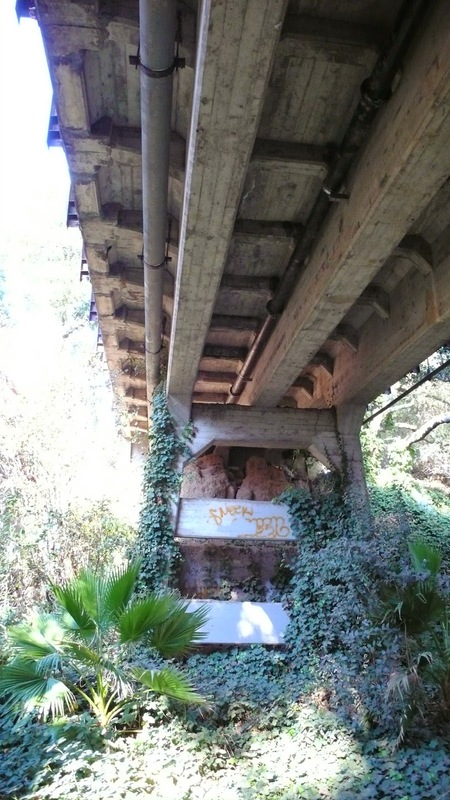 The next structure we visited was the Alum Rock Avenue Bridge across Meguelita Creek (39C0511), a 3-span T-girder bridge on concrete piers. This bridge is 120 ft long with a 52 ft main span and it was built in 1920. We looked closely at the piers but we couldn't find any damage from the M5.6 earthquake. Santa Clara County, California Bridges: Alum Rock Avenue Bridge across Miguelita Creek by Mark Yashinsky is licensed under a Creative Commons Attribution-NonCommercial-NoDerivatives 4.0 International License.